The first step toward proper maintenance of the UltimateAir RecoupAerator® ERV is filling out the Warranty Registration. Sending in warranty card will help our staff provide the best possible service should you ever need it. The following is a list of components which should be addressed regularly to ensure that your fresh air system continues to run at its highest level of performance. 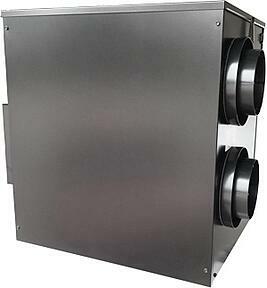 Aluminum pre-filters should be cleaned at least once every 6 months. Clean more frequently if necessary. Disconnect the power to the RecoupAerator®. Remove the Metal Filter Access cover. Remove the two rectangular foam inserts. Slide the aluminum pre-filters out, being careful not to bend the frames. There will be one long, and one short filter. Check the filters for build-up and replace if clogged. All RecoupAerator filters may be soaked in warm soapy water then rinsed clean. Dry pre-filters completely or reinsert and run the RecoupAerator to aid drying. Postion the 2 rectangular foam inserts and install the Metal Cover. Heat Transfer Core Filter (“Pies”) Click to Purchase! Disconnect power to the RecoupAerator®. Remove the aluminum pre-filter. Only the long pre-filter will need to be removed. If the heat exchange material is a medium gray or darker and less than two years old, it’s probably in need of cleaning. Pull out the exposed filter material “pies”, manually rotating the wheel to access the remaining wedges. Wash in a container of warm water then gently press to remove excess water. Then lay filters flat until mostly dry before reinstalling. Running the RecoupAerator as soon as filters are installed will help them dry. To avoid disruption of service you may want to have a spare set. Replace each filter wedge using the above process and replace one at a time. Rotate the wheel by hand making sure that the pieces are completely and evenly replaced so that none drag as the wheel rotates. Access the opposite side of the wheel to adjust the filter wedge position. Replace the aluminum pre-filter, foam inserts, and Metal Cover. Restore power and run unit to aid drying of filters. Check periodically throughout the year to ensure the fresh air inlet and stale air exhaust ducts do not become clogged with leaves, grass, snow, or bird nests. Debris can usually be wiped out with a dry cloth. Before performing service, TURN OFF & DISCONNECT power from the unit. You can disconnect power by either unplugging or switching the breaker in the building breaker box. Otherwise the unit’s power supply will remain hot and could cause serious bodily injury!